Step 1. 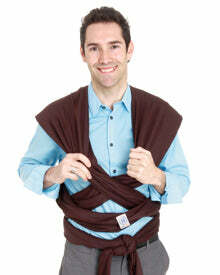 Wrap so that the shoulder piece closest to your body is the side on which you will carry baby. Step 2. Shift the MOBY so that the fabric “X” is moved from your front to your side. Step 3. Place one of baby’s legs through the shoulder piece closest to your body, so that baby straddles your hip. Spread the fabric over baby’s bottom and shoulder. Step 4. Fully spread the fabric, ensuring it is to the hollows of baby’s knees and over baby’s entire back.